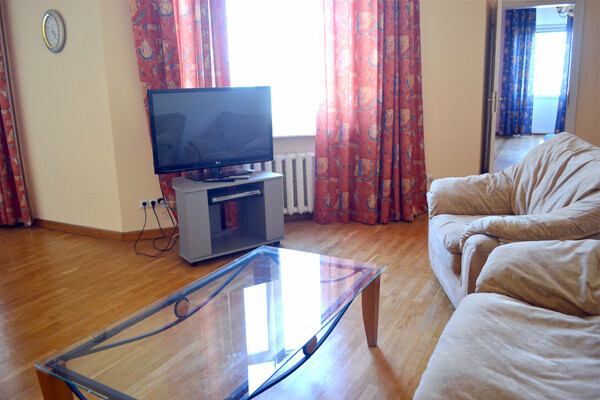 This apartment is located in the very center of Kyiv, right near Maidan and Khreshchatyk street (2-3 minutes walking). 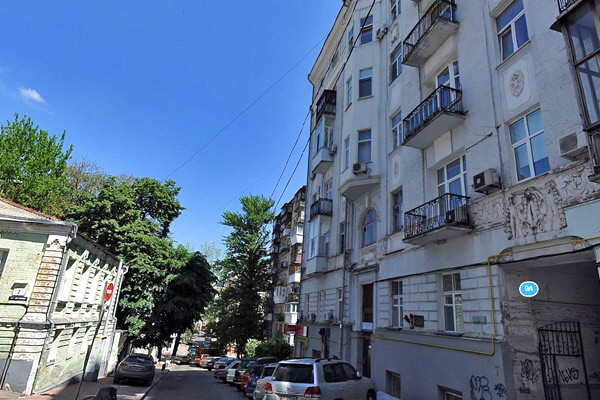 Mykhailivsky lane is a small side street without huge city traffic but with numerous hotels and restaurants. 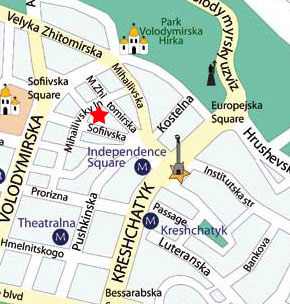 Tourists cross this street on their way from Maidan Square towards St.Sophia Cathedral and Andriivsky descent. And of course this place is safe and quiet any time of the day or night. You will find several 24 hours groceries nearby and a couple of big supermarkets on Maidan area. Volodymyrska hill, very popular and picturesque city park is located just a few steps away from the building. One of the most fashionable of Kiev hotels - Hyatt Regency is standing right across of Mykhaylivskyy lane. The apartment is located on the 6th floor of historical building with elevator, secure entrance and intercom downstairs. Spacious (about 100 square meters of space), with tall ceilings, new renovation and balcony with panoramic view on central part of the city. It consists of two bedrooms and living-room connected with kitchen area. Bedrooms come with king-size double-beds, living-room has transforming sofa, therefore this apartment can accommodate up to 6 guests.Wooden floors are made of parquet, air conditioners present in each room. 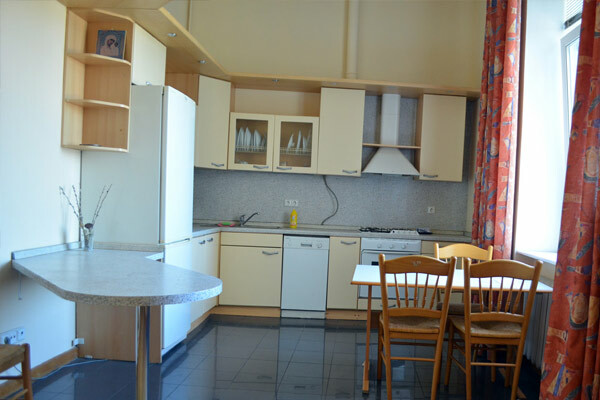 Functional kitchen allows cooking and serving meals, there are enough glassware, dishes, microwave, fridge, gas stove. Kitchen comes with big dining table and chairs. 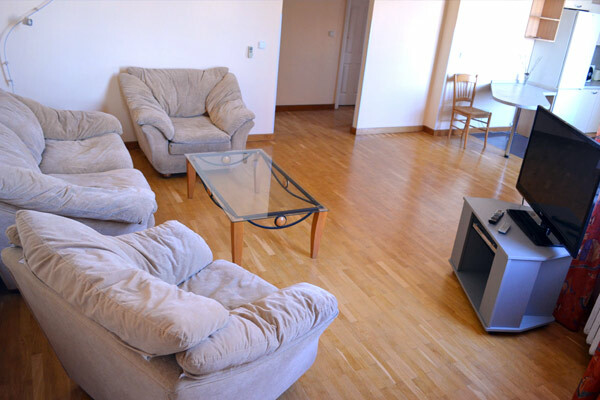 Also apartment is supplied with WiFi, LCD TVset has a set of cable multi-language channels, washing machine, big wardrobes. 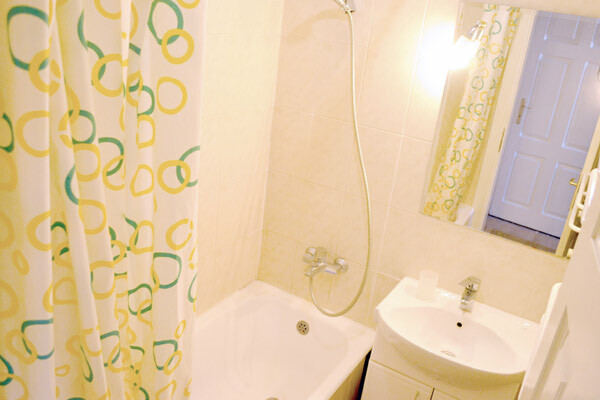 In fact, this is one of the best our apartments, comfortable and accommodating, popular among all categories of guests.